ST. PETERSBURG, Fla. -- Hurricane Irma churned across the Atlantic Ocean, battering several Caribbean islands before moving on to the Florida Keys and the U.S. mainland. Photos from the Operational Land Imager (OLI) on the Landsat 8 satellite show some of Irma’s effect on the British and U.S. Virgin Islands from space. The OLI took the photos before and after the storm passed through the area. There are several possible reasons for the widespread browning of the landscape. The storm’s strong winds can rip away lush green tropical vegetation, leaving the satellite with a view of more bare ground. Also, salt spray whipped up by the hurricane can coat and desiccate leaves while they are still on the trees. Irma passed through the northernmost Virgin Islands on the afternoon of Sept. 6. Irma was a category 5 hurricane at the time with maximum sustained winds of 185 mph. The islands saw significant devastation. A close-up of Virgin Gorda gives a better sense of the changes. Note how some of the vegetation on the south and west of the island is a bit greener, likely because it was partly shielded from winds by the hills in the center. Differences in ocean color likely stem from differences in the ocean surface -- rougher surfaces scatter more light, and appear brighter and lighter. The destruction is also visible on Barbuda. The category-5 storm directly hit the small island in the eastern Caribbean on Sept. 6. Moderate Resolution Imaging Spectroradiometer (MODIS) on NASA’s Terra and Aqua satellites took the images. 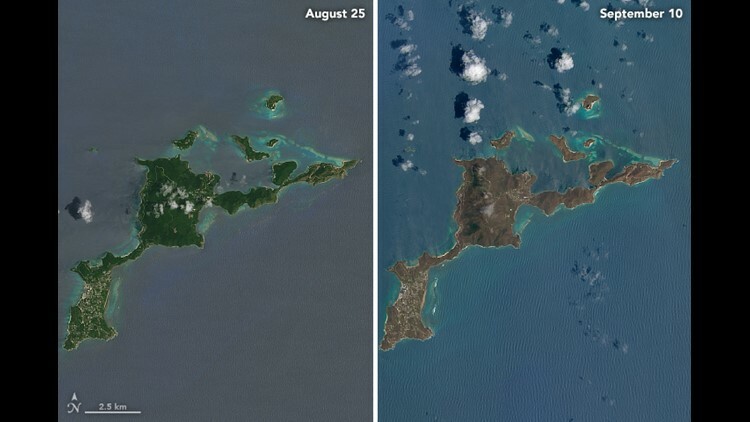 The left image shows Barbuda on Aug. 21, and the right image shows the ravaged landscape on Sept. 8. However, vegetation on Antigua appears relatively healthy and intact by satellite. The island sustained less damage than others with the storm’s center passing to the north. Crews had restored electricity to most of the island by Sept. 7. The island’s airport has also reopened. Editor’s Note: Information from NASA’s website is used in this story. Mark Bergin is a digital journalist with 10News WTSP. Like him on Facebook and follow him on Twitter and Instagram. You can also email him at mbergin@wtsp.com.